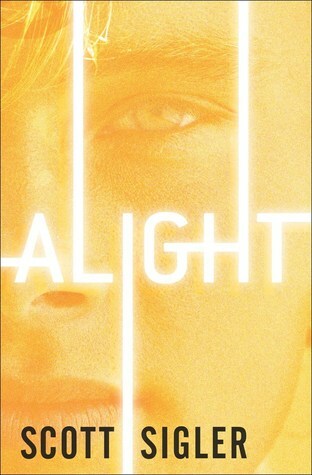 Alight is the second installment in the YA sci-fi adventure trilogy by New York Times bestselling author Scott Sigler, hot on the heels of Alive. What a fantastic followup to Alive, the first book in this series! The author uses a nice technique for reminding the reader what happened in that book – something I appreciated. Again, the group finds themselves in unfamiliar territory – this time a new planet where they face one obstacle after another, be it people or situations. This author really knows how to put his characters through the wringer using conflict and that’s one of the reasons this series is so compelling. The cast of supporting characters is diverse and enjoyable, but Em, the MC, is probably my least favorite. I kept getting whiplash from her rapidly changing emotions – sound decision-making to paranoia over others scheming to undermine her leadership, being sure of her feelings for one character, then all but forgetting about him when she was with another. I think that’s just a personal thing for me, though. Some new characters were introduced and others didn’t make it through this alive, but you know I don’t do spoilers. With the “What the *#$@?” moment at the end, the next book looks to be just as exciting as this one. I can’t wait. Alight is scheduled for publication April 5, 2016. I received a digital ARC of this book from NetGalley in exchange for an honest review. This sounds intriguing, I’m going to check it out. I have Nocturnal in my audio library but won’t listen to the narrator anymore. I’ll have to look at the book version, I think. I haven’t read Nocturnal – saw it on sale recently and almost got it, but trying to get the TBR pile down to a more reasonable level. Hi Cathy. If the reason you won’t listen to the NOCTURNAL narrator is what I think it is, I completely understand. I hope you get a chance to check out ALIVE and ALIGHT, both of which are narrated by Emma Galvin (who did the DIVERGENT books). Hi Scott, yes, it’s probably the same reason. I’ve added Alive to my library, looking forward to listening. I hope you dig ALIVE. Emma is a fantastic narrator, perfectly suited for ALONE and ALIGHT. I have always been a fan of endings that leave you almost shouting in disbelief. And what a great way to lead the reader to the next book in the series! I know, right? Some people hate cliffhangers, but they always get me excited about the next book. Thank you for the delightful review of ALIGHT. I am thrilled the “holy cats!” ending delivered for you. Book III, ALONE, gets intense fast. You’re welcome, Scott! Really enjoyed it – hope Alone gets here soon because after that ending, i need to know what’s going on.